A Laser Distance Measurer transmits a pulse of laser light to the target and then measures the time that it takes for the reflection’s way back to the Laser Distance Meter. For ranges up to 200m, the accuracy of the best measuring devices is about 2mm. Furthermore on-board processing enables the device to add and subtract and to triangulate or to calculate areas and volumes. There are a lot advantages for these modern gadgets compared with an old-fashioned tape. A Laser Distance Measure outperforms on every field: accuracy, speed, versatility, safety, functionality and convenience. Devices based on ultrasonic are similar in many ways, but there is a big gap in accuracy. The first laser distance meter was presented by Leica in 1993. It is amazing that a lot of different names are used for this laser tools since then: Electronic Tape Measures, Laser Distance Measuring Tool, Electronic Tape Measures, Laser Distance Finder or even Digital Measuring Device. The laser light is used to measure distances very accurately. It is easy to use as you only have to point the laser distance meters dot at a target. It doesn’t matter if the target is a wall or any object that reflects the laser dot. Please note that we focus on Laser Distance Meters, that are suitable for surveying in construction. We are not looking at laser range finders – these are much less precise.They are adequate for the use in hunting, forestry and golf. The measuring device shows the distance on its screen. It can show different units of measure, you just cycle through the units till you find the desired units. It is even possible to change the units after a measurement. A LDM can be put up against a wall and then it measures from its back so that you get true wall-to-wall distance. Ceiling measurements can be done in the same way. A rule of thumb is that time savings and accuracy increase with the height of the ceiling. 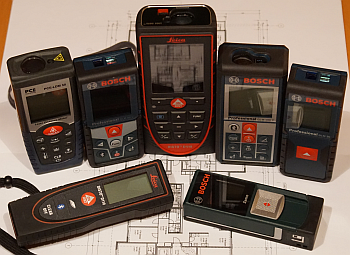 What are the main differences between the laser distance meter models? You should check the maximum range or distance, which could be measured. Accuracy is also very important. There is the ISO 16331-1 that guarantees a high level of accuracy.